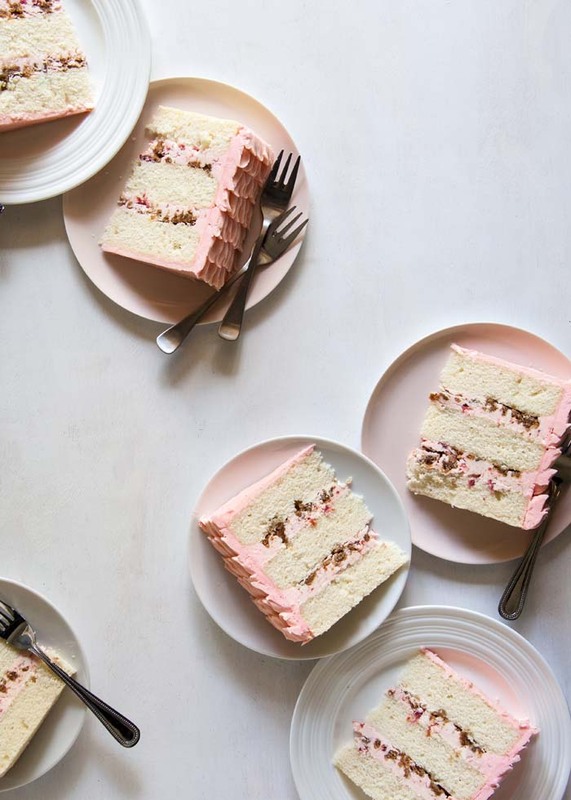 Today we're excited to share with you a gorgeous cake recipe from Tessa Huff of Style Sweet CA and her new cookbook, Layered, Baking, Building, and Styling Spectacular Cakes. Tessa is a recipe developer, stylist, and food photographer based here in Vancouver, B.C., and we're really stoked to be able to share one of her beautifully styled treats. 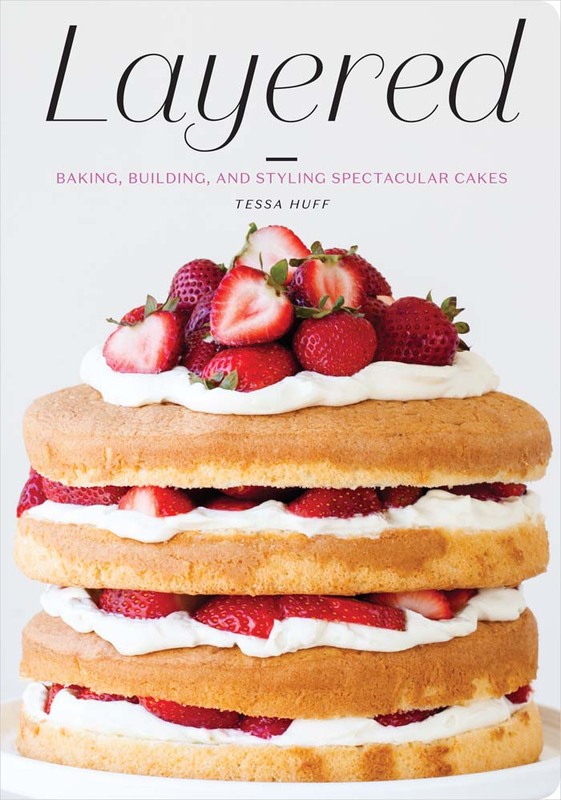 This really is a gorgeous book with 150 recipes and if you are a cake baker and decorator, or know someone who is, this book is a must-have! 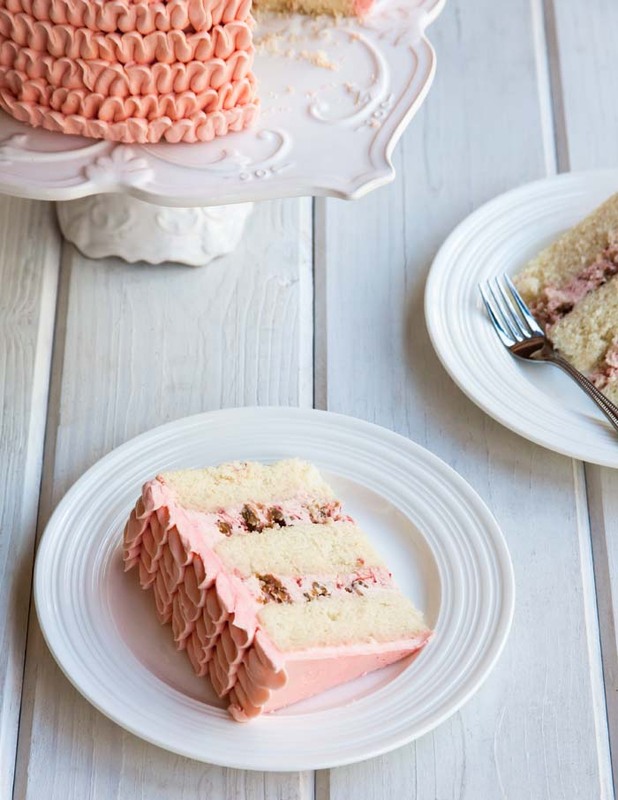 Tessa's gorgeous styling, along with delicious recipe ideas make for quite the treat! Get the recipe after the jump! 1. Preheat the oven to 350F (175C). Grease and flower three 8-inch (20cm) cake pans and set aside. 3. In the bowl of a stand mixer fitted with the paddle attachment, beat the butter on medium speed until smooth. Add the sugar and mix on medium-high until the butter is light and fluffy, 3 to 5 minutes. Stop the mixer and scrape down the bowl. 4. Turn the mixer to medium-low and gradually add the vanilla and egg whites until combined. Stop the mixer and scrape down the bowl. 5. Turn the mixer to low and add the flour mixture in three batches, alternating with the Riesling, beginning and ending with the flour mixture. Mix on medium for no more than 30 seconds after the last streaks of the dry ingredients combined. 6. Evenly divide the batter among the prepared pans. Bake for 23-25 minutes, or until a toothpick inserted into the center of the cakes comes out clean. Let them cool on a wire rack for 10 to 15 minutes before removing the cakes from their pans. 7. Combine the strawberries, rhubarb, sugar and lemon juice in a medium saucepan and cook them over medium high heat, stirring intermittently with a wooden spoon, until the juices start to bubble. Reduce the heat to maintain a simmer and cook for 8 to 10 minutes, or until the fruit starts to break down. Remove the pan from the heat and let cool. Makes about 4-1/2 cups (1L); enough to frost a three-layer 8-inch (20cm) round cake or fill and frost a three-layer 6 inch (15cm) round cake. Place the egg whites and sugar in the bolw of a stand mixer. Whisk them together by hand to combine. Fill a medium saucepan with a few inches of water and place it over medium high heat. Place the mixer bowl on top of the saucepan to create a double boiler. The bottom of the bowl should not touch the water. Whisking intermittently, heat the egg mixture until it registers 160F on a candy thermometer or is hot to the touch. Once hot, carefully fit the mixer bowl onto the stand mixer. With the whisk attachment, beat the egg white mixture on high speed for 8 to 10 minutes, until it holds medium-stiff peaks. When done, the outside of the mixer bowl should return to room temperature and no residual heat should be escaping the meringue out of the top of the bowl. Stop the mixer and swap out the whisk attachment for the paddle. With the mixer on low speed, add the butter, a few tablespoons at a time, then the vanilla. Once incorporated, turn up the mixer speed to medium-high and beat until the buttercream is silky smooth, 3 to 5 minutes. (Oat Crumble recipe after the jump)! 9. Preheat the oven to 375F (190C). Line a baking sheet with parchment paper. 10. In a medium bowl, mix together the oats, almonds, brown sugar, flour, butter, honey, cinnamon, and salt with a wooden spoon until combined. The mixture should resemble clumps of sand. Sprinkle it over the lined baking sheet and bake stirring halfway through for 8 to 10 minutes, or until golden bown. Let it cool and crumble the mixture into smaller pieces, if necessary. 11. Once the cakes have completely cooled, level them and choose which layer will be at the bottom. Place it on a cake plate or serving dish. Spread on 1 cup (240ml) of the rhubarb buttercream with an offset spatula. Sprinkle it with 1/2 to 3/4 cup of the oat crumble. Top with the next layer of cake and repeat with the buttercream and remaining crumble, finishing with the final layer. 12. Add the gel food colouring, if using, to the remaining vanilla buttercream. Use it to frost the top and sides of the cake. Top with fresh strawberries, if using and serve with the remaining compote. 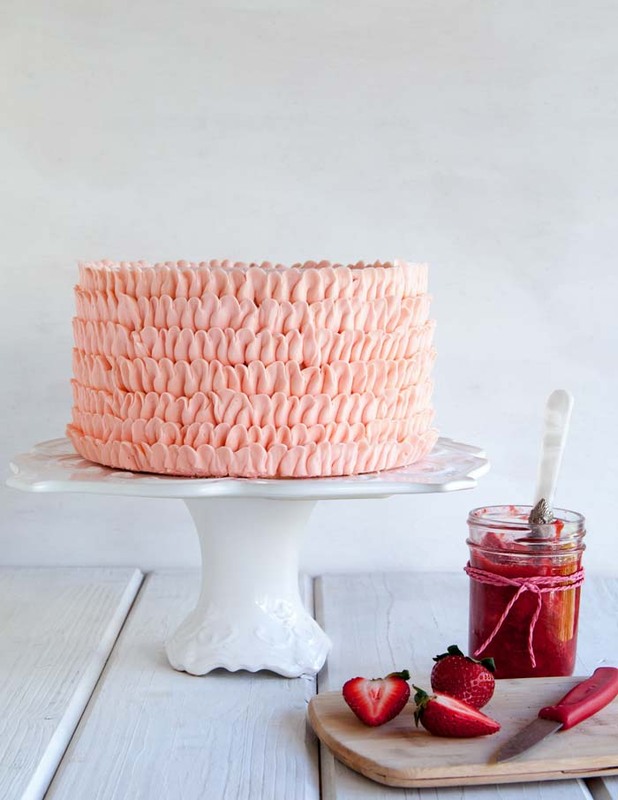 To create the ruffle design in the photo, fill a pastry bag fitted with a petal tip and buttercream. Starting at the top of the cake, pipe rows of continuous, horizontal ruffle swags around the cake. Invert the swag by keeping the narrow end of the petal tip facing upward. Start the second row slightly overlapping the bottom of the top row and continue around and down the cake. For a simpler finish, 1 large reicpe of buttercream will do. Note: This cake will keep in the fridge for up to 4 days; it may also be frozen.